Dunlop AdhesivesNewsGet groutstanding tiling with Dunlop GX-500 – the new, all-in-one grout for walls and floors! Get groutstanding tiling with Dunlop GX-500 – the new, all-in-one grout for walls and floors! 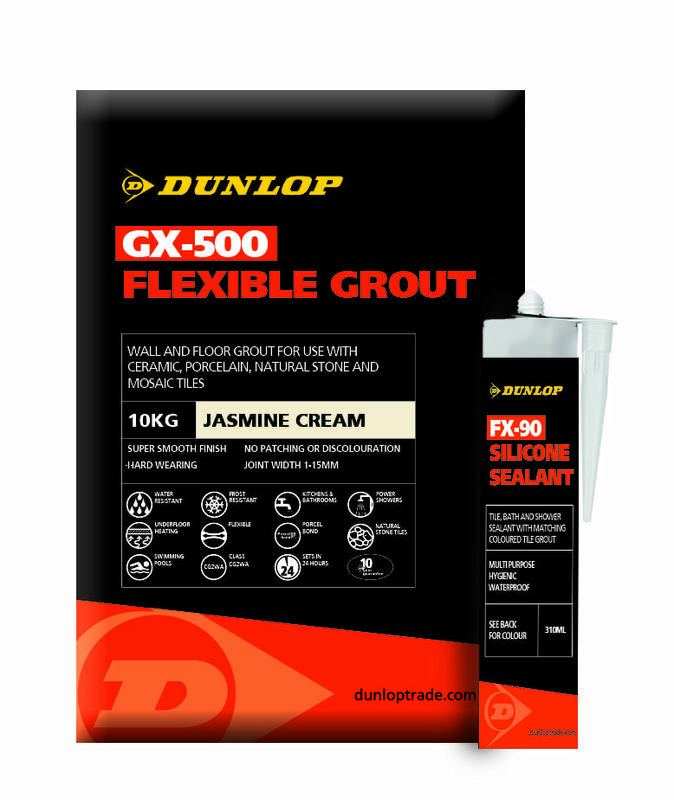 GX-500 is Dunlop’s most advanced tile grout yet and provides builders and contractors with an all-round grout in eight unique colours. Suitable for wall AND floor tiling, Dunlop GX-500 can be used for almost any situation and with most tile types including ceramic, porcelain, natural stone and mosaic tiles. Water and frost resistant, it comes in a range of shades to suit any project request including Polar White, Jasmine Cream, Harvest Beige, Sahara Sand, Conker Brown, Mist Grey, Graphite Grey and Liquorice Black. It also means it can be used in complex installations where flexibility is required, such as over underfloor heating, swimming pools and heavily trafficked areas. Because of its unique formulation, it can be used from 1-15mm joint widths – meaning it can be used for almost any tiling design with large or small format tiles. Debi Boulton, Sales and Marketing Manager at Dunlop said: “With more and more specialist tiling work being carried out by tradespeople, and a request for larger tiles, narrow tile joints and a greater variety of grout colours – we identified a need for an all-in-one wall and floor grout that covers all these bases. “Many other grouts on the market can only be used for certain situations – such as wall tiling, or floor tiling, small joints or wide joints and the colour-range is often limited. “With the launch of GX-500, we are taking away the stress of trying to fulfil a client’s long-list of wishes and needs. And despite it being an all-round product, this doesn’t mean we’ve had to scrimp on quality! As well as quality products, Dunlop supports tradesman with a nationwide team of Product Support Technicians and Technical Helpline. Simply call 01782 591120 for help and support.